Emotions have been a point of interest for researchers for centuries since there is no definitive answer to the question “What is emotion?” Some says that emotion is an instinctive or intuitive feeling as distinguished from reasoning and knowledge. But still as emotions are difficult at best to define, our attempt is to understand the user’s emotional state and henceforth, analyze it. 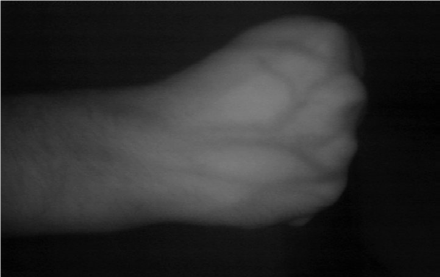 Hand vein thermography, being 99.25% accurate in measuring human emotions, best fits our purpose. It has minimum effect on user’s interaction without causing distress or interruption. Hand sweat and micro-perspirations are capable of processing even the most subtle emotional responses to moment to moment or minute to minute life events. 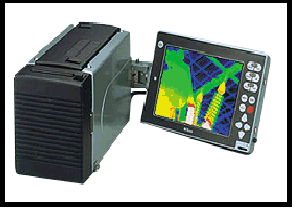 Thermography brings skin temperature recording into the space age. Instead of “loading” the skin by using contact thermometers, such as thermocouples, and obtaining inaccurate temperature readings or a record of an isolated area, thermographs furnish thermal maps of large areas of skin surface without touching the subject. They not only offer pictorial representations of skin temperatures whose interpretation opens entirely new fields for the study of human emotions but also, detect minute change in temperature. Since the radiation of heat by human body is a unique characteristic of individual, unchangeable by surgery and invariant to time even in case of identical twins, it is often used for security purpose to circumvent fraudulent attempts. Human body radiates heat and the pattern of heat radiation is a characteristic of each individual body. An image indicating the heat emanating from different parts of the body can be acquired with an infrared sensor and these images are called thermograms. The setup works as below. 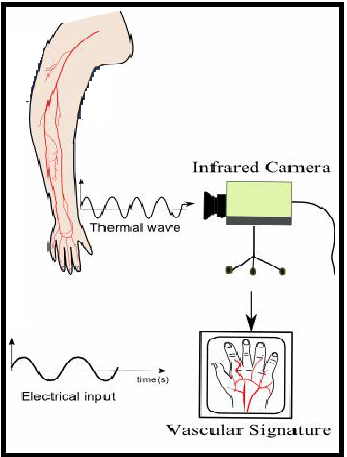 Infrared vein thermograms acquire images of vein structures of the palm or the back of the hand without any physical contact and as they are non-invasive, they are considered as acceptable biometrics. The structure of the vein is used for the identification as the vein structure is unique to every individual, even among identical twins. Near-infrared(NIR) is, in general, used in this case. Besides, the camera needed to capture the template is generally Nikon Laird-S270 Infrared camera. The acquisition system calibration is performed with a black-body. Then, the temperature distribution is given by a two-dimensional image of the human skin obtained by converting the gray level at each pixel with a calibration curve. Knowing the human body temperature range and the room temperature, the calibration is generally taken between 15°C and 50°C. The skin tissue containing veins possesses a temperature gradient. Areas just above the vein emanate light with higher intensity and thus appear as brighter regions in a thermal image. It shows that the fingers are hotter than the back of the hand, except on the regions just over the veins which shows that the person is angry. 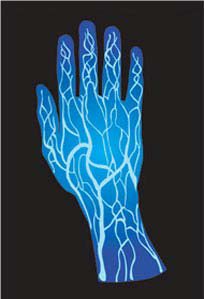 The temperature on the image is displayed between 24°C (room temperature) to 35°C corresponding to the highest temperature of the vein pixels for the hand shown in Figure. Image acquisition is challenging in uncontrolled environments, where heat emanating surfaces (e.g., room heaters and vehicle exhaust pipes) are present in the vicinity of the body as it increases the perspiration rate and body temperature explicitly. Infrared sensors are prohibitively expensive which is a factor inhibiting wide spread use of the thermograms. Henceforth, it is evident that, this is an efficient technique and can be brought into wide use if the few shortcomings can be resolved.